The PMPRB and its regulatory framework were designed at a time before the Internet or cell phones. Built to respond to changing intellectual property standards of the mid-1980s, price protection for patentees was seen as a good trade-off for attracting R&D. Price ceilings were based on pricing data that was public and compared against the highest R&D jurisdictions in the hopes of emulating them. In the 30 years since, the anticipated benefits haven’t materialized and the regulatory pricing model is broken. June 2016 discussion paper identified aspects of the Guidelines that are thought to be out of step with recent developments in the PMPRB’s operating environment. Require patentees to disclose confidential rebates to third parties. Support a risk-based approach to regulating drug prices that simplifies and streamlines compliance for patentees. The Steering Committee will be assisted by a technical Working Group (the “Working Group”) with expertise in health technology assessment and other economic and scientific matters. Is the proposed division and treatment of Category 1 and Category 2 drugs a reasonable risk-based regulatory approach? 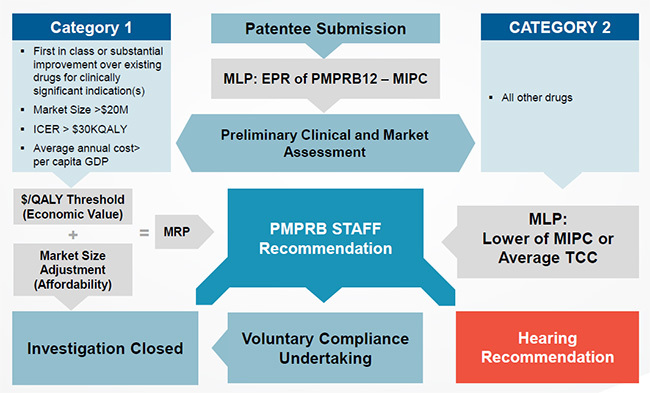 Is an MLP based on the median of the PMPRB12 (MIPC) for all drugs reasonable? Should exceptions be made to the MLP-MIPC test and, if so, when and why? Should there be a price floor for Category 2 drugs based on LIPC? Should further drug categories exist with different treatment modalities from those proposed? Should more or less criteria be considered in screening a drug as higher risk and, where should the line be drawn with respect to the criteria? Should the pharmacoeconomic, market size and GDP factors apply both as screens and thresholds? Should Category 2 drugs be scrutinized more or less than proposed? Should the cost effectiveness threshold for Category 1 drugs vary? Should a Category 1 drug ever have more than one MRP? Are there economic considerations that would support a higher MRP for some Category 1 drugs than would result from the proposed application of the new factors? How often and in what circumstances should a drug be rebenched? Should confidential third party pricing information only be used for compliance purposes? Is there a better way to deal with existing drugs under the new framework? Are there opportunities to further reduce regulatory burden while respecting the dual objectives? A risk-based approach to price regulation that considers value and affordability, in addition to list prices in other like-minded countries. The MLP will be a transparent ceiling based on public list prices but the MRP, which applies to Category 1 drugs only, will be confidential. To comply with the MRP, patentees of Category 1 drugs will be required to submit information on undisclosed rebates to third parties. Slide 11 is a work-flow diagram of how the proposed PRICE review process will function. The first step in the process is the receipt of a Patentee submission for a new patented drug which is represented the box in the center of the diagram. From there, a Maximum List Price (MLP) is established. This is done through an external price review based on the PMPRB12 countries, as proposed in the amendments to the Regulations. The MLP is established as the median of an international price comparison (MIPC) of the countries in the PMPRB12. This is represented in the box below the receipt of the Patentee submission. A Category 1 drug, the attributes of which are included in the box to the left, indicated by an arrow pointing to the box. A Category 2 drug, all other drugs that do not have a Category 1 classification. This is represented by the box to the right. Once a drug is classified as a Category 1 drug, it moves down to the box that represents an Economic Value test. To pass this test, the drug’s cost effectiveness value must be below a certain $/QALY threshold. If the drug passes the economic value test, it moves to the box below which represents an affordability test, based on a market size adjustment. If the drug fails either the economic value test or affordability test it moves to a central box. The central box represents the PMPRB Staff Recommendation stage. If the a drug passes both the economic value test and affordability test, it then moves down to the last box on the left and the Investigation is closed. At the top right is the starting box for Category 2 drugs. For this category the Median International Price is compared to the Average of the Therapeutic Class Comparison. The MLP becomes the lower of the two tests as indicated in the second box on the right. From here, the drug moves to the centre box, PMPRB Staff Recommendation stage. At the PMPRB Staff Recommendation stage, staff review the merits of each drug on a case-by-case basis and make a recommendation to the Board. At this stage, PMPRB Staff make one of the following recommendations: Close Investigation as indicated in the box at the bottom left; proceed to a Hearing as indicated by the box at the bottom right; or agree to a Voluntary Compliance Undertaking as indicated in the bottom center box. From the Voluntary Compliance Undertaking box, the drug moves to the Investigation Closed stage on the bottom left once the VCU has been signed. How inflation affects maximum prices in Canada The price of a drug can increase every year with inflation. However, if a drug’s price decreases in one year, its ceiling price the next year will be constrained by that decrease in price. The ceiling price of a new drug is fixed at introduction. Prices can vary freely below this level in subsequent years. Changes to the maximum ceiling price after a new drug enters Canada Once a new drug is given its ceiling price, it can only change through inflation or if the drug company voluntary lowers it. The maximum price may be rebenched after a few years based on specific changes in market conditions. Market size and GDP* The total amount of money available to be spent on new drugs every year is not considered by the PMPRB in setting a maximum price The market size of a new drug is a function of how much it costs and how many patients will need it. Drugs that are expected to have a significant market size and impact on the healthcare system will have a lower ceiling price to deter rationing. All new drugs are assigned a Maximum List Price (MLP) based on the median of the PMPRB 12 (MIPC). IMS will be used to verify international list prices. All other drugs will be deemed Category 2 and have an MLP based on the lower of the MIPC and the average of the domestic therapeutic class (ATCC). No Category 2 drug will be given an MLP that is lower than the lowest price country in the PMPRB12 (LIPC floor). Have an average annual treatment cost above per capita GDP. Empirical work undertaken by Karl Claxton at the University of York suggests a $30K/QALY opportunity cost threshold for Canada. PMPRB will use this estimate at the screening phase to determine whether a drug should go in Category 1 or Category 2. Category 1 drugs will then be subject to a baseline maximum value-based price ceiling of $60K/QALY, for reasons of practicality and efficiency. Drugs that meet certain clinical characteristics (e.g., high burden of disease or significant absolute gain in QALY) may be subject to a higher $/QALY ceiling. A Category 1 drug that meets the applicable $/QALY ceiling may still face an adjustment in price if the application of the market size and GDP factors raise affordability concerns. Using new drug contribution to GDP and GDP growth over the last five years, the PMPRB is estimating a threshold of $20M per new drug. New Category 1 drugs with an estimated market size that exceeds this threshold within any of its first five years of sale will require further price adjustments. The adjustment would see the MRP reduced by a certain percentage discount which would increase as the expected market size increases. The $20M threshold would also increase annually based on GDP growth and/or CPI. As mentioned, Category 2 and have an MLP based on the lower of the MIPC and the average of the domestic therapeutic class (ATCC). However, no Category 2 drug will be given an MLP that is lower than the lowest price country in the PMPRB12 (LIPC floor). All new drugs will be given an interim MLP of 3 years or until the drug is sold in 7 countries, whichever comes first. ATPs are calculated net of all discounts to determine compliance with confidential MRP. Category 2 drugs will be assessed against MLP. whether circumstances in the market have changed to warrant a rebenching/reclassification. Existing drugs will be given an interim price ceiling based on the MIPC of the PMPRB12. An existing drug will only be classified as Category 1 if it fails a $100K/QALY screen for any indication. Existing drugs that are screened into Category 1 will be prioritized for re-benching. Category 2 drugs will be re-benched later unless a complaint is received. All drugs within a therapeutic class will be assessed at the same time for the purposes of the ATCC test. Patentees will be advised in advance of re-benching and given two reporting periods to come into compliance. The Steering Committee has until July 13 to identify further issues it believes would benefit from expert review and analysis.